Today at the 'patch' there were not so many birds but a good one was on the percolation pond - a first year Citrine Wagtail. 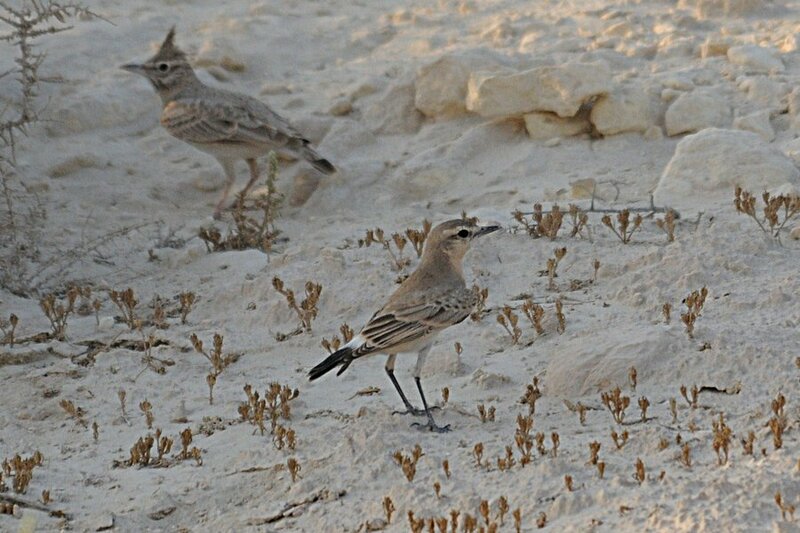 It was feeding on insects along the muddy edge along with six Yellow Wagtail and is the first time I have seen the species in Saudi Arabia. Seven white morph Indian Reef Heron was the highest number I have seen together on the pond at any one time and a single Little Egret was also with them. Two Garganey, a Teal and another unidentified small duck were present along with 30+ Sand Martin and a single Barn Swallow. Waders included a Terek Sandpiper, one Common Snipe, five Green Sandpiper, three Wood Sandpiper, two Ruff, six Common Ringed Plover, eight Black-winged Stilt, 11 Little Stint and 30+ Kentish Plover. A couple of Eurasian Hoopoe where seen and Phil Roberts also saw an adult European Roller. The spray fields were very quite with the only good bird being a single Isabelline Wheatear.